I anticipated with glee, on the potentially mind-blowing Pan Mee varieties from this supposedly “Pan Mee Specialist” named Peking Pan Mee Noodles Shop in Medan Ipoh Bistari; a relatively new eatery (about 3 months’ old) on the same row as Akamomiji Japanese Restaurant, and directly opposite of Kafe Tim coffee shop. The Pumpkin-flavoured Pan Mee noodles done the ‘dry’ style with crunchy anchovies, wood ear fungus (mook yee), sweet leaves (Sayur manis) and strips of shiitake mushrooms. But the breakfast experience fell short off the mark; leaving us in doubt whether the crowd were there solely for the varieties of pan mee on their menu, for the convenience of the distance away from tourists-packed areas, or maybe from sheer word-of-mouth, publicity in the Chinese dailies, etc? The place resembles more of a mid range cafe than a coffee shop, with delicious shots of their pan mee all printed on the banners, and posters on the wall. I half-expected the place to be crowded, but not packed to the brim! We were there about 9am+ on a Saturday morning, and thankfully there was one vacant table left. Though the six of us had to squeeze and elbow our way around the table, we persevered until we saw a table of six finally leaving the premise. But the shop suffered from a serious lack of manpower. Only two persons taking the orders; one being a designated lady running the cashier counter, while the other was an elderly man whom did not even bother to clean up our table. Two other staff were running all over the place, serving drinks and food, clearing tables, and such. The adverse effect was imminent, when we had to wave frantically before anyone cared to clear our table and take our orders. Not to mention I had to walk over and grab a menu myself. They offer three types of noodles; the Pumpkin, Wolfberry and Spinach (though it’s listed as Cabbage in the menu) flavoured flat flour noodles. You can have them served in soup, or dry (tossed with soy sauce etc), or in curry, or even dry curry ala Ipoh’s famous dry curry mee. 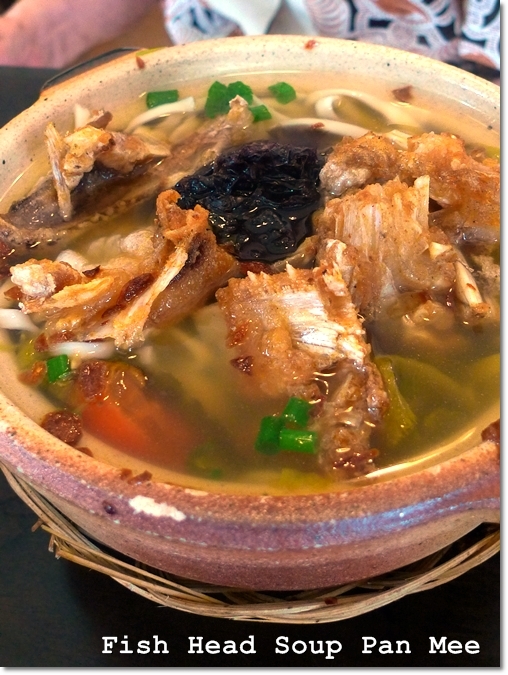 But there are wackier creations like Ginger Duck Pan Mee (‘Chi Keong Ngap‘), Spicy Fermented Soya Bean Fish Head Pan Mee and even a special RM10/USD3.20 per pot, only available on Wednesdays, Saturdays and Sundays – Ginger Wine Chicken Pan Mee. 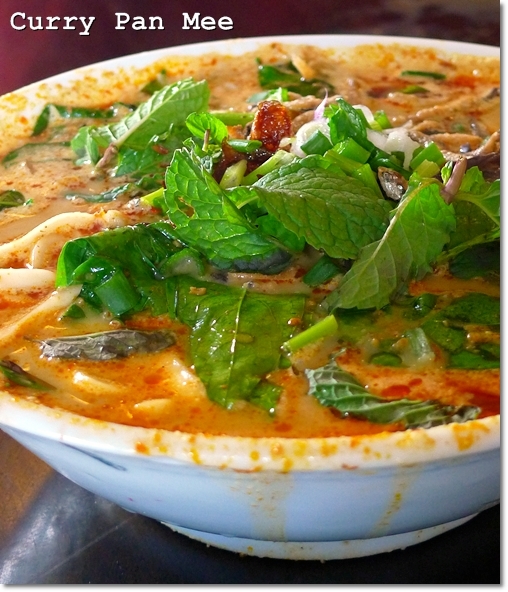 A sinfully rich Curry Pan Mee; excessively pumped up with ‘santan’ (coconut milk). Mum and dad ordered the Dry Pan Mee; one being the Pumpkin version while dad had the Spinach flavoured noodles. But to her disappointment, mum’s Pumpkin pan mee was sourish, having this unpleasant taste almost like vinegar, but it was not. Even dad’s spinach noodles had this similar taste. Aside from that, the anchovies were not crunchy, while the sauce was a tad oily. Clearly, she has had better ones elsewhere in Ipoh. 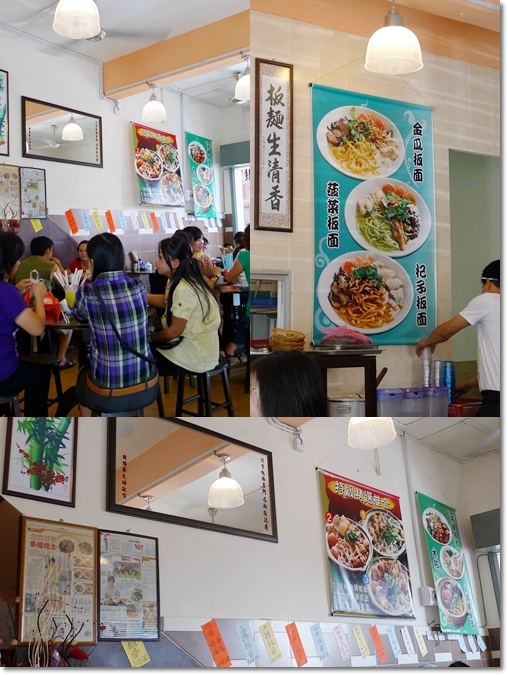 * By the way, Mum was raving about this pan mee stall in Wah Pan Coffee Shop in town. Anyone? And here’s the contender to Kin Kin Chili Pan Mee here in Ipoh. The Dry Chili Pan Mee (with the poached egg missing, noticeably) @ Peking Pan Mee. I was torn between the Ginger Wine Chicken Pan Mee (a special that’s available only on Wed, Sat & Sun), and this Dry Chili Pan Mee. The latter because I was keen on FINALLY trying a Chili Pan Mee here in Ipoh, instead of trying the many versions in Kuala Lumpur. Anyway, the ensemble looked mighty promising on the plate; Generous portion of the flat noodles, with chunks of chicken, anchovies, sweet leaves, chopped scallions, strips of wood ear fungus and of course, a handful of their homemade chili flakes/paste. Of course, the poached egg is sorely missed in this one, but no complaints for the portion was almost double of the one at Kin Kin. The Dry Chili Pan Mee; after some thorough mixing. With a glass of iced coffee at hand, I was half expecting to breathe fire. Or at least torched my tongue. Nope. Far from it, in fact. For the level of spiciness was almost zilch; even a child can slurp the noodles with a victorious snigger. Okay, slightly exaggerated. But definitely not the fiery chili pan mee that I was craving for. (Pardon me for I forgot to check around for additional dried chili flakes placed on the table like the ones in KL). Furthermore, after some good tossing, the noodles tasted a little salty. Though the side serving of the pan mee soup (soup only) somewhat helped to tamper down the saltiness. Pickled Vegetables Fish Head Pan Mee (RM7.00/USD2.20) – You can also choose to have this with rice vermicelli noodles aka mee hoon. Thankfully, both of the grandmas’ claypot fish head pan mee with pickled vegetables passed the test. Not with flying colours, for they commented on the not-too-bouncy noodles (soggy would be the word). But the soup was sweet, flavourful with a tangy finish thanks to the pickled vegetables and tomatoes. The fish head was deep-fried prior to being served. Until the very end of our meal, we remembered about the Yong Tau Foo that has yet to arrive. Since this was the lady’s recommendation, we decided to give this a try. 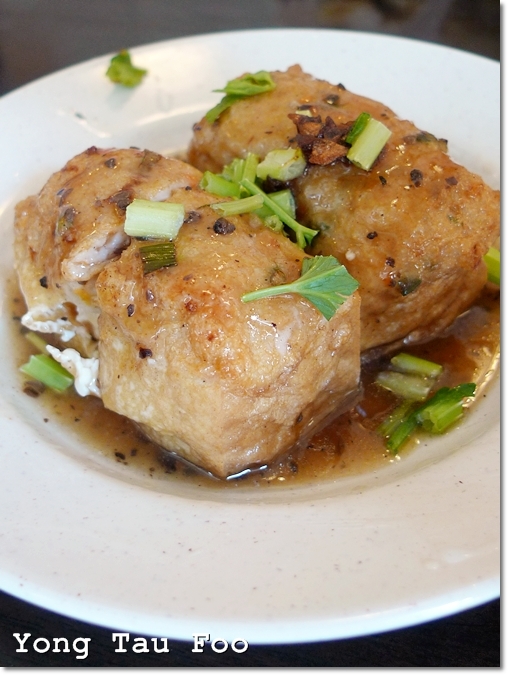 Two rather hefty chunks of soft beancurd stuffed with a patty of pork+fish, then served in a hot bean sauce. The beancurd was alright, since RM3.00 get you two blocks, considered value for money? * On a side note, Kwong Hong in Gunung Rapat makes the BEST stuffed beancurd I have tasted in Ipoh. Seriously good stuff, but gotta wait for them to fry them freshly from the kitchen. 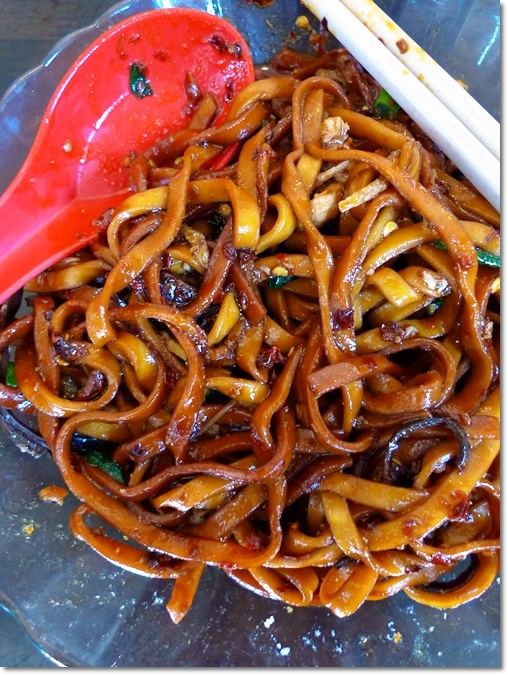 Peking Pan Mee Noodles Shop – Did something go wrong somewhere? All in all, the breakfast experience was far from satisfactory. Yes, I understand that the crowd spells success, and there are already several good reviews on the net. Criz was the one that egged me on to try this, aside from a review from Simple Girl. 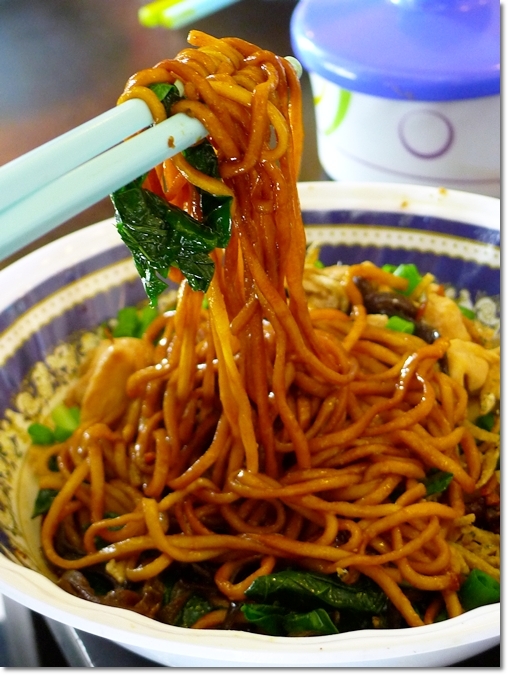 Even on the Facebook page, I have read several recommendations to give Peking Pan Mee a try. Not to mention the latest coercing move by a colleague of mine. Not too bad in taste (the dry versions), at least the noodles are not ‘tough’ but a bit salty. Not adventurous to try other flavors though. I thought that the soup version would be better, no? Indeed the noodles are not tough, but on that morning the noodles suffered from being a little soggy. Just give the rest a try. Maybe you may just like them. For me, I don’t think so. I have heard of good reviews about the pan mee at Kafe Tim. Albeit the long wait? Now this should be on my list. And seemingly, Kafe Tim houses a good dry beef noodles stall. Right? Yeah, looks can be deceiving sometimes. 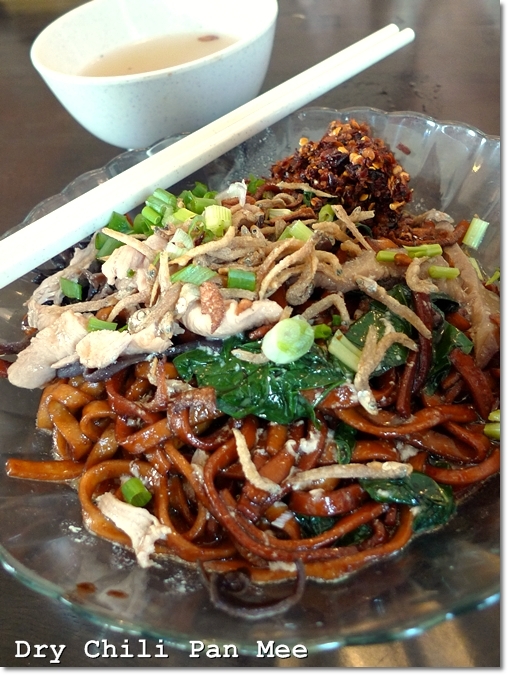 try the the pan mee in kafe tim. that is very good (dry version). the one in gunung rapat is good too on both versions but a tad oily on the dry. maybe this shop is cashing in from those who heard about the good pan mee in medan ipoh bistari but not knowing the exact location which it actually at kafe tim. Confusing the crowd? Whoops … me included then. Anyway, I have heard good comments about Kafe Tim’s pan mee, but the slightly daunting wait (sometimes 45 mins!) had me thinking twice. Maybe I should go as early as possible, and be their first customer. btw, the chilli pan mee at the mia (pengkalan) is good. but once in a while, there’s a slip and it came too saltish. I tell u, the moment i look at the first pic I’m salivating. NV feel so miserable before in my life, So craving for good food! Yeah, many varieties though they could have improved on the most basic of a good bowl of pan mee; the Noodles. My Mum loves pan mee, there are not many good pan mee in KL:( Dry beef noddles is my favorite. Must take a trip back to Ipoh soon! Really?!! 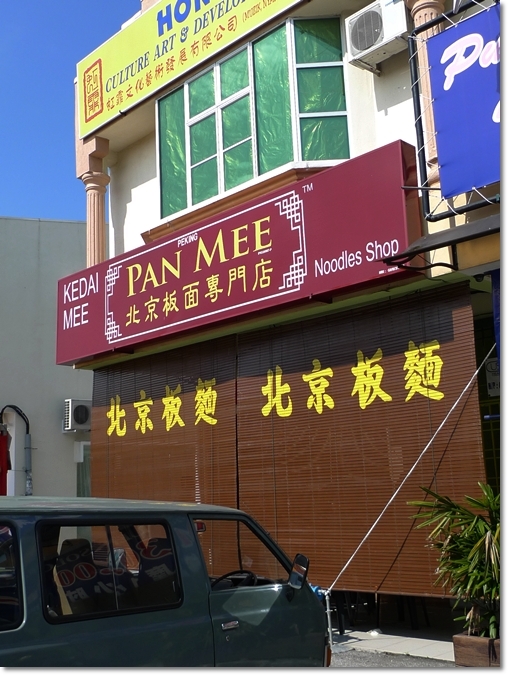 But there are way more pan mee outlets in KL/Selangor than in Ipoh …!!! Though to find the traditional style without the fancy additions, Ipoh got a lot of these stalls. Agree with you…food and the wait is bad. Opposite is better in taste. The one beside Kafe Tim. Kafe Tim pan mee is nice. you’ll need to wait if you go during breakfast. I have eaten a few times during lunch and hey! no need to wait at all wor… even before Peking Pan Mee shopped existed. Where else to get good pan mee? Go to Kafe Macy at Ipoh Garden East. 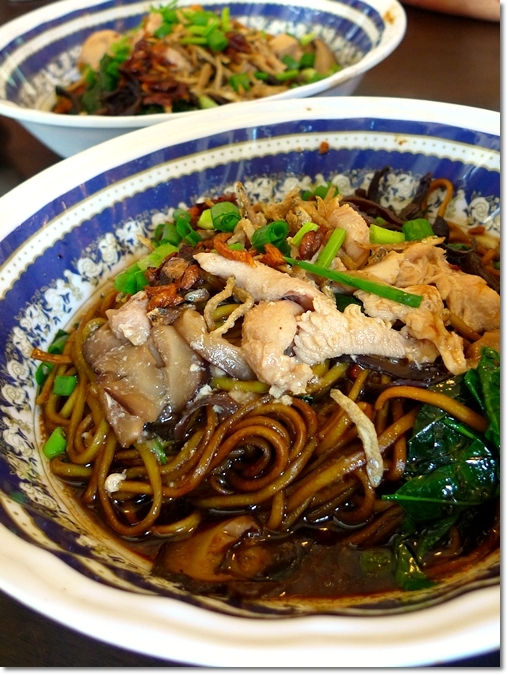 their dry pan mee is great stuff – almost the only food I eat when I go there! Oh … how about the tong sui and the Kai See Hor Fun leh? The kai See Hor Fun has always been one of the better stand alone ones in Ipoh, I felt. But it’s been years since I tasted that …. the morning crowd on a weekend is scary. have u try the pan mee @ The Mia, behind pengkalan tesco shoplots, supposingly to be the eat city. last row facing the bushes. quite nice. i like their black pepper and dry chili pan mee. can give it a try. Eat City again? Hey, this place has got many giving the thumbs up, I noticed! Even a black pepper version? Great. I’ve tried the one at Kafe Tim. Unfortunately, due to bad timing only got to try the dry version which was only ok for me cos’ I’m a die-hard fan pf the soup version. At the time I was there, they ran out of soup, so no choice had to go for the dry version. Will have to go back again to try the soup version as I am still in search of a GOOD pan mee in Ipoh but sadly have found none that’s as good as some I’ve had in KL. My all-time fav pan mee stall is in Jln Alor, inside a shop called Meng Kee. Downside: Periodically have to bear the stench coming from the drain at the back of the shop 🙁 Please do post up the BEST pan mee in Ipoh when you’ve discover it! I’ll be very grateful 🙂 ! Sure Anne. Thanks for sharing your dry pan mee experience too. On the contrary, I like DRY version of any noodles. Not a fan of hot, soupy meals. I will definitely share it here; once I discover a pan mee to my liking. I was rather surprised by your feedback here as I did not encounter any problem with the noodles as well as the taste. It could be due to the noodles being prepared earlier for the morning crowd whereas mine was fresh from the machine slightly after lunch time. Too bad, it surely meant that we could no longer rely on their taste consistency. Your encounter also applied to one of my recent review restaurants. On the day of review it was good but the next day the same item has a totally different taste and texture. Through my interrogation… LOL! It was due to the freshness of the ingredients on that day. Well, that could be the reason too. Yeah, I was too. After reading your review, I was so engrossed with the thought of finally finding one pan mee that deserves praises. But alas, the experience was not to be. Probably that was one of their “off” days, when the freshness of the noodles (as you said) was compromised. If you had read the feedback comments here, and on the All About Ipoh page, you would be even more surprised! Though the shop was doing brisk business, damn hard to find a vacant seat. i did try before but the taste no good at all expecially chili pan mee.i love the QQ pan mee at kampar which is more better. Kampar ah? Hmm, never heard before. But this Peking Pan Mee is a little over-rated. My personal opinion, at least.